In this tutorial, I'll show you how I created this "Sleeves" badge for my project. For the base of the badge I start with .3 mm plastic sheet. 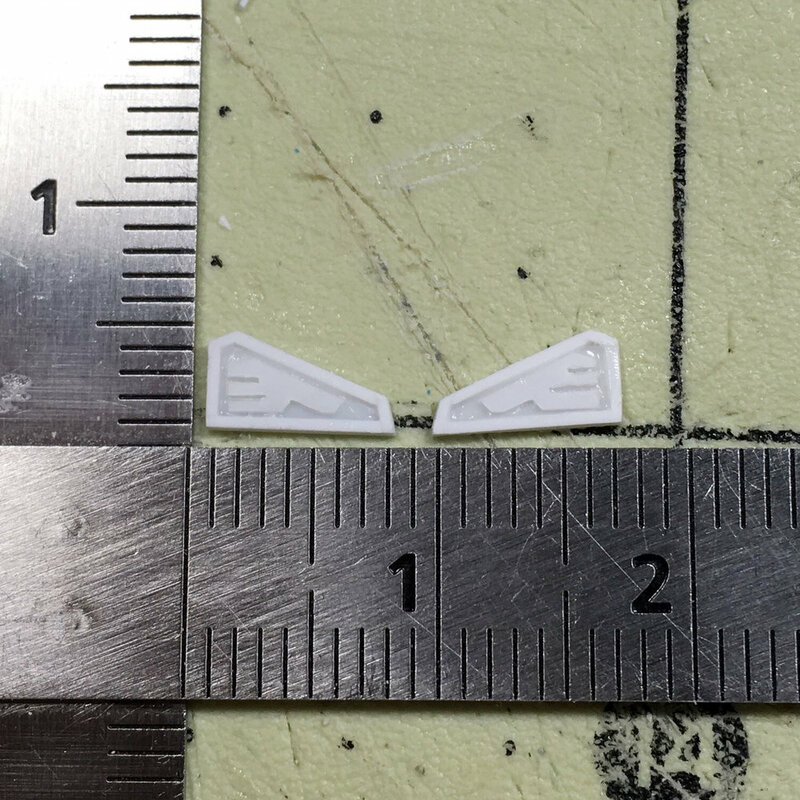 The shape and size of the badge will be different depending on your project, but mine was 7mm x 4mm. I used .5 x .25 mm strip by Evergreen for the border around the badges. I started with the shortest edges first, since they would be the hardest to glue down simply because of their size and lack of glue area. I intentionally left some strip overhang so that I could trim it flush with the base of the badge. I'll omit this step for the next few border pieces, but it's best to cut the piece long and trim it down to size. I added the long edges next. Finding the correct angles for the border pieces to meet up can be tricky. I like to use the piece itself as a guide and eyeball, or estimate, the cut and trim it down to get the final angle for the piece. The top piece was the most difficult since it had two tricky angles, but patience and delicate work will eventually get you to success. The last piece was the back border. Only one angle to cut and an easy right angle. To make the emblem I started with a "plug" that fit perfectly inside the borders. Stay patient and cut, check repeat until you get a perfectly sized plug. After I had the plug, I trimed it down on all sides just a bit. I also cut off the left tip of the emblem as well as a small cutout at the bottom to better replicate a stylized wing. For the "feathers" of the wing, I used a .2 mm chisel to get nice uniform lines. After that I glued the piece in place and evened out the plug with the .2 mm chisel, carefully following the edge of the borders to get a constant space. Lastly give the entire surface a light sanding to make sure it's nice and flat. At this point you're probably wondering how you're going to paint this detail. It's pretty simple really. *Note: I use Mr. Color paint, primer, and clear coats, which are all laquer based. The first step I'd do is to paint the entire badge in white and leave it until all of your other paint work is done. Clear coat your model parts in preparation for panel lining with a nice gloss lacquer. Once that's done simply fill in the badge recesses with enamel black panel line wash until it's filled. For clean up you can use lighter fluid or your choice of chemicals. Just be careful not to damage the piece. Here you can see just how small these things are. Here you can see the effect of this detail. Once painted the badges will look amazing on any "Sleeves" mobile suit. Here is what the Sleeves Badge looks like on the Ozymandias. I think they came out great and they're exactly what I wanted to achieve!